Long ago, I struggled with making bread – no matter what, the dough wouldn’t rise or something would go wrong – and I would end up with a gummy or yeasty heavy loaf that didn’t turn out. (Or my hands would get tired kneading and I’d give up too soon.) I’ve made a lot of mistakes… and since then, I’ve realized that it really isn’t that hard to make bread! To ensure that your bread is successful, make sure that your yeast is fresh (check the expiration date) and has been stored appropriately. Second, make sure you use a forgiving/easy recipe that has a high chance of success. And in my opinion, if you can get a machine to do the kneading for you (or use recipe that require no kneading at all)… even better! Look at the crispy crust and chewy interior! But what about making European style breads with a CRISPY crust and CHEWY interior? While my popular tang zhong technique works well to create soft and fluffy Asian style breads, these are the opposite of rustic European loaves. Last time I went to buy a rustic loaf of European style bread, it was $10. TEN dollars for flour + water + yeast. I can buy a 10 pound bag of flour and a jar of yeast for less than that! It’s much cheaper to make bread if you know how. Plus… when you make the bread yourself, you can control all of the ingredients, and you can have exactly what you want – whenever you want it! There is something kind of wonderful about the smell of fresh baked bread… With the recipe below, you can make a master batch of dough in about 2 minutes (no kneading necessary! 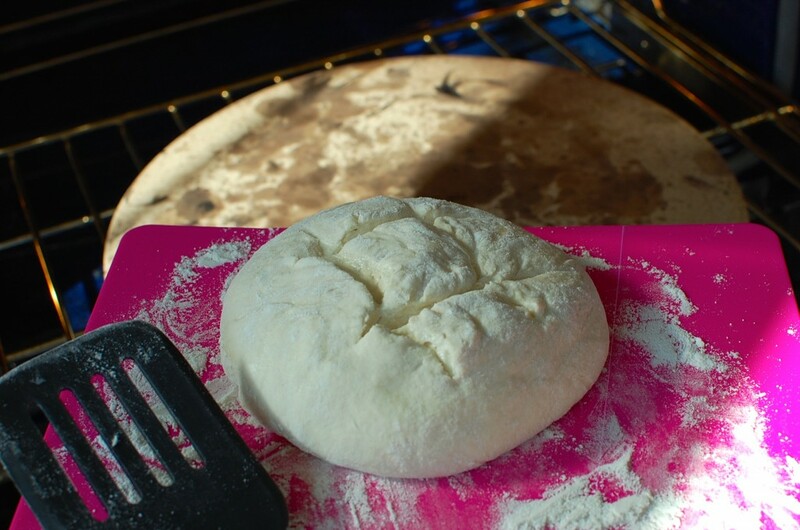 ), then store that dough in the refrigerator for up to 2 weeks. Anytime during the 2 weeks, you can pull out a hunk of dough and bake it for fresh bread. This recipe will yield about 4 loaves… and the flavor (like sourdough) will develop during the 2 week storage. So your first few loaves will be more mild in taste, your last few loaves will be more sourdough like in taste. 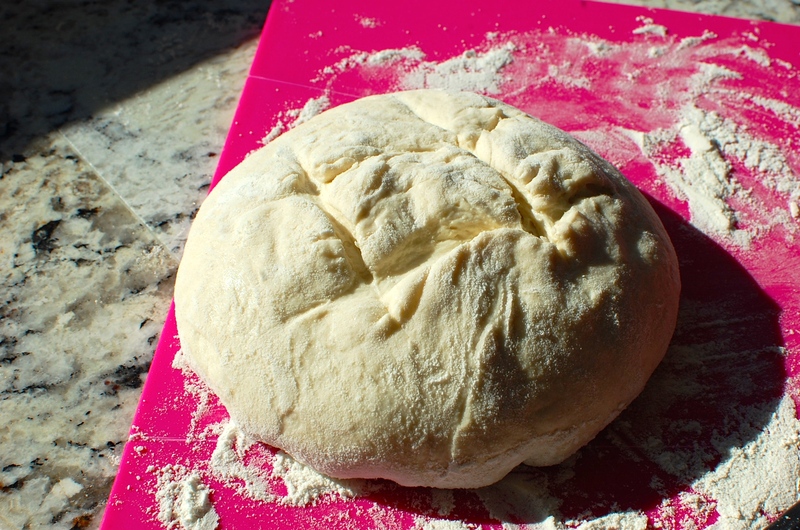 It’s great to have this dough in the refrigerator so you can bake up a loaf of fresh bread whenever you want! 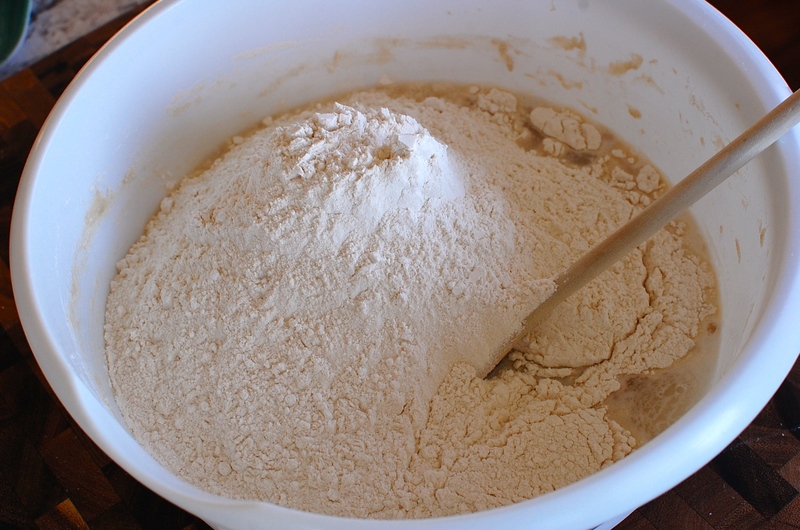 If you are going to use a lot of yeast – it’s much cheaper to buy yeast in a jar or in bulk from the health food store, rather than buy those little envelopes from the supermarket. In the baking aisle of the regular grocery store, you can buy a 4 oz. jar of active dry yeast for about $4 to $9 (check the expiration dates, and make sure you choose the jar with the longer life left). 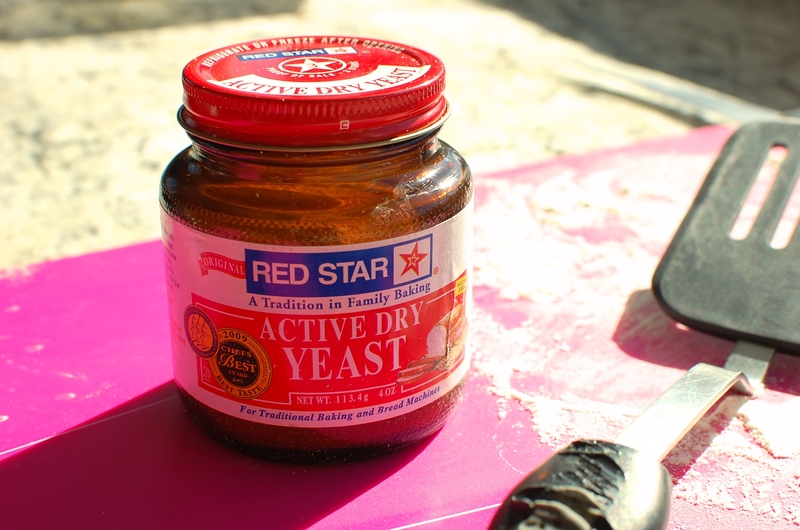 Store your yeast in the refrigerator, and it will last a long time. 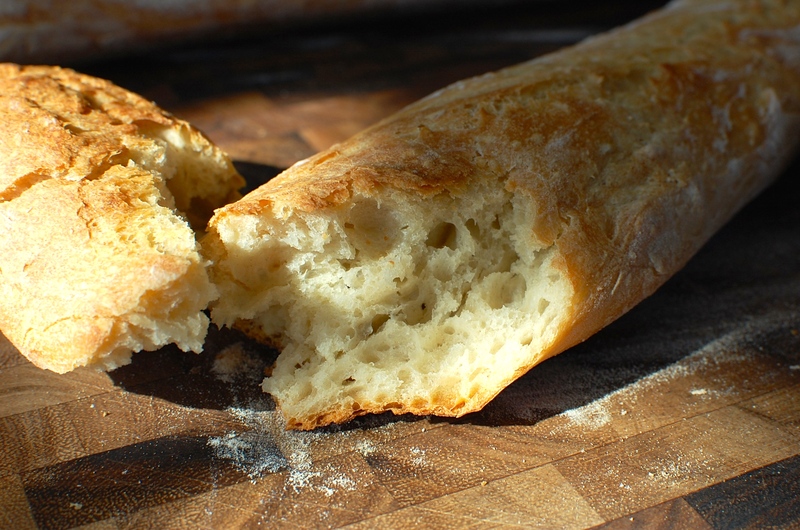 For the flour, if you want your bread to be WHITE… like what you would have in a french baguette, then use BLEACHED all purpose flour. If you want a more rustic look, or if you don’t care about the whiteness of the bread, then go with UNBLEACHED all purpose flour. This recipe is adapted from the master recipe in the book The New Artisan Bread in Five Minutes a Day: The Discovery That Revolutionizes Home Baking by Jeff Hertzberg and Zoe Francois. I HIGHLY recommend this book!!! This is a book that was designed for regular people (like you and me) with easy to understand instructions, pictures, and explanations. The authors give great directions on how to adapt this basic recipe to create different kinds of breads… in a very simple and easy to accomplish method. It really isn’t hard to make wonderful, authentic, artisan bread – you will be surprised by how easy it is! Buy your yeast in a jar - it's much cheaper than those little envelopes. Store the jar in the refrigerator. **The new revised edition of the book recommends 1 T. yeast, instead of the previous recommendation of 1 1/2 T. I initially used this recipe with the higher amount 1 1/2 T. yeast – which worked well. If that works for you, you might consider decreasing the yeast in your next batch and see how it works out for you with less. (So the yeast you need might be somewhere between 1.5 T. yeast = 4.5 tsp. yeast and 1 T. yeast = 3 tsp. yeast.) Using only 1 T. yeast seems to be working just the same for me – and it makes the bread cheaper, since you are using less yeast per loaf. 3. Mix the flour into the water using a wooden spoon. 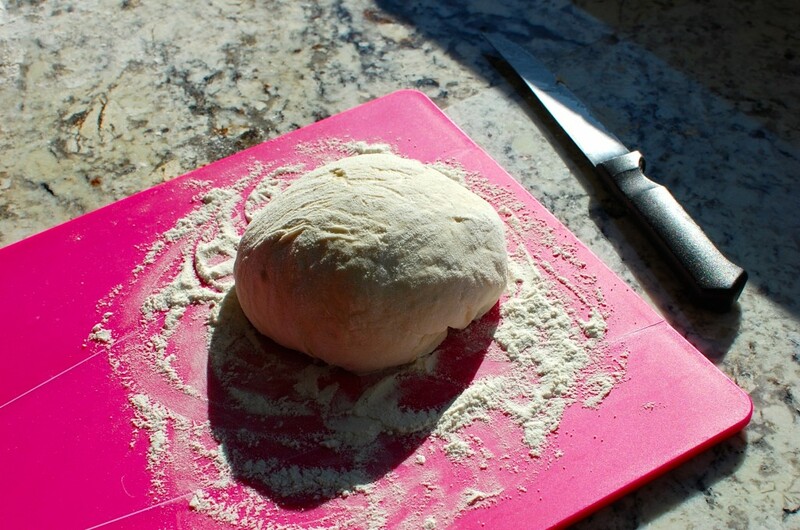 You can use your hands towards the end if it’s easier – but you do not have to knead the dough. Just mix until the dough comes together, and that’s it. 4. Now you will loosely cover the dough (I use plastic wrap and leave an air gap on the side of the bowl to allow venting) and allow it to rise at room temperature for about 2 hours. The dough will rise and start to look spongy, then it will eventually begin to flatten and collapse on itself – this is what you want. 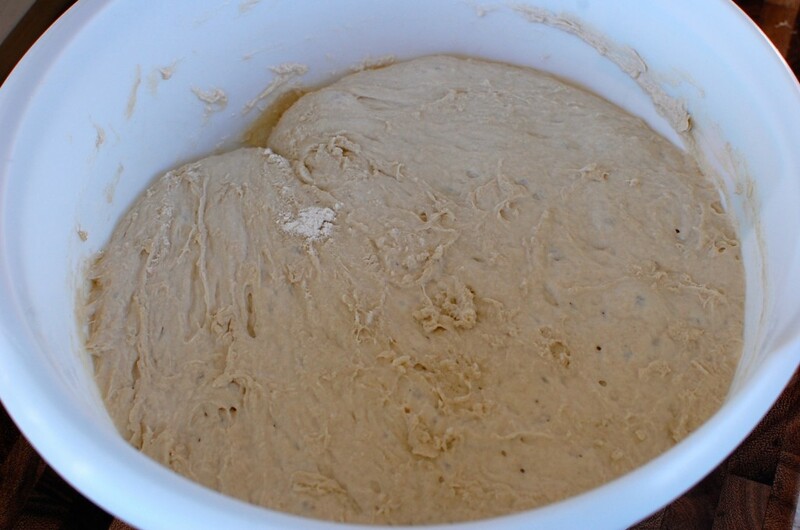 (If after the 2 hour rise, your dough has not collapsed, it’s ok. Just cover (vented) and store in the refrigerator.) The first time you make this dough, it’s best not to make the bread the same day – wait at least a day. 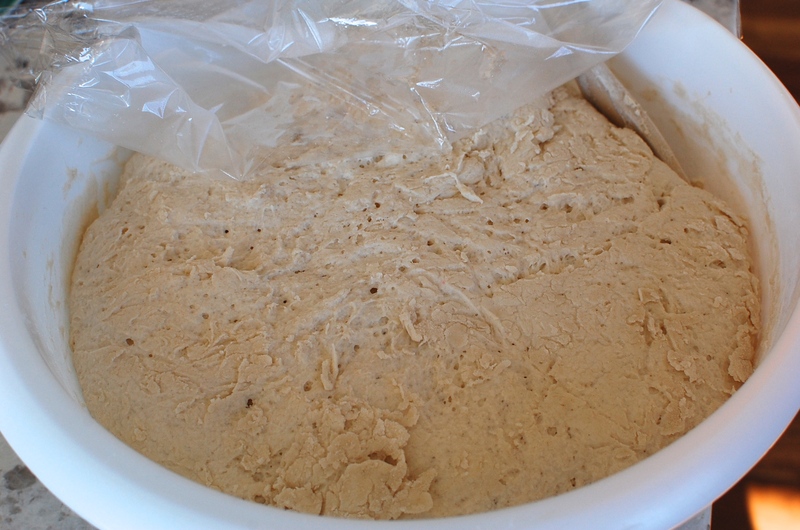 The dough will be much easier to handle when cold, and the flavor will be better past the first day. While the round boule shape is easiest, you don’t have to limit yourself to this shape. 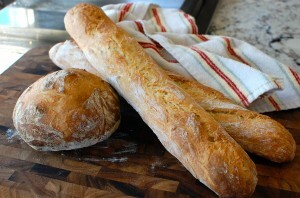 You can make rectangular batards, or even long baguettes. 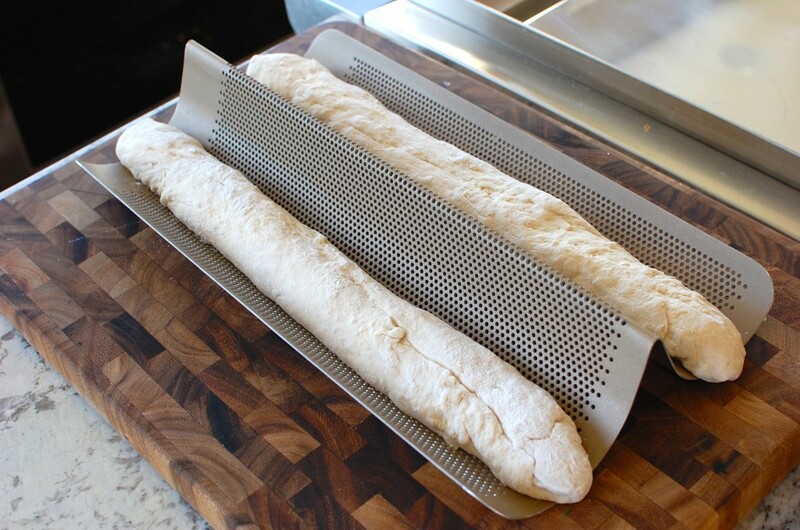 Here, I shaped two portions of dough into long baguettes. 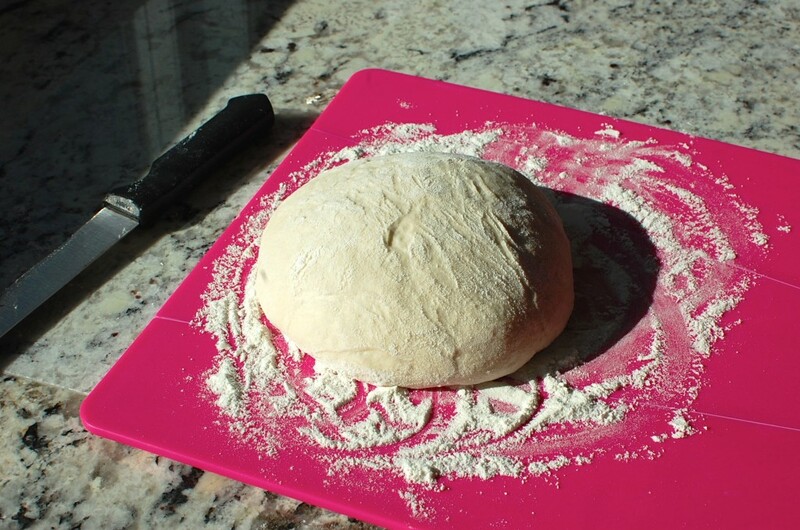 Same technique – just try not to handle the dough too much, make sure the bottom is well-floured, and try to create a smooth surface on the top. 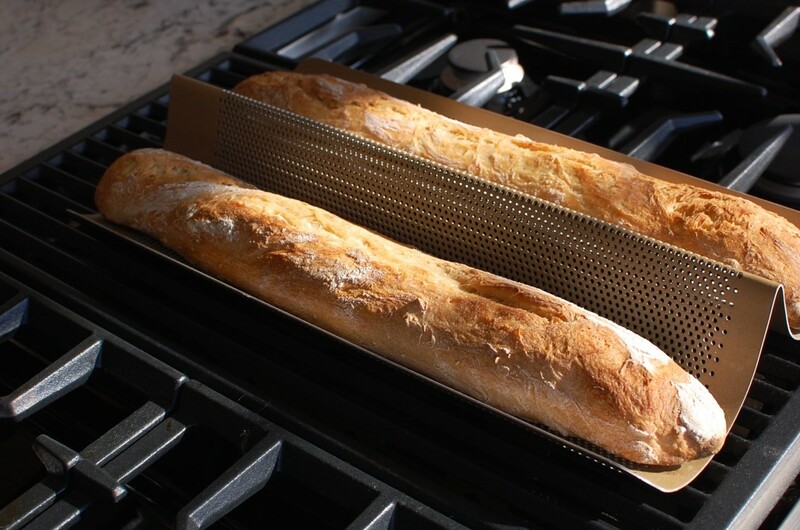 If you are making baguettes, it seems to work best if you place them on a perforated metal baguette pan for the rising step and baking step. 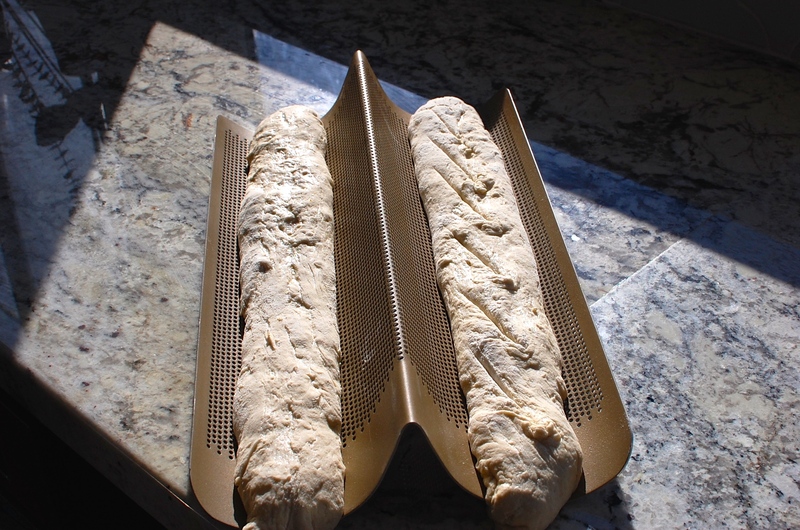 I got this “Goldtouch Nonstick Perforated French Bread Pan” at Williams-Sonoma for $28. 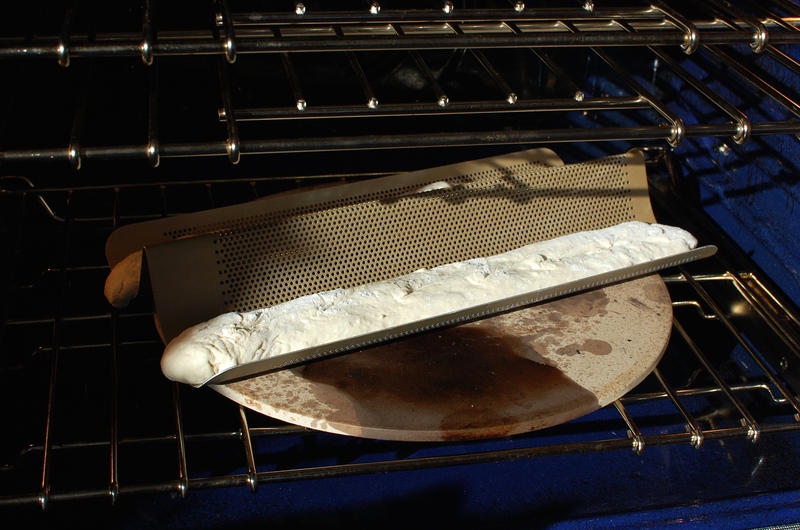 Amazon sells a similar Non-Stick Perforated French Bread Pan for about $19. 7. Let the loaf rise for about 40 minutes, uncovered. It’s ok if the dough doesn’t look like it has risen much – it will rise much more in the oven. If you are making baguettes, make diagonal slashes down the loaf (see slashes on the loaf to the right, in the photo below). 11. Remove the baked loaf and allow to cool. 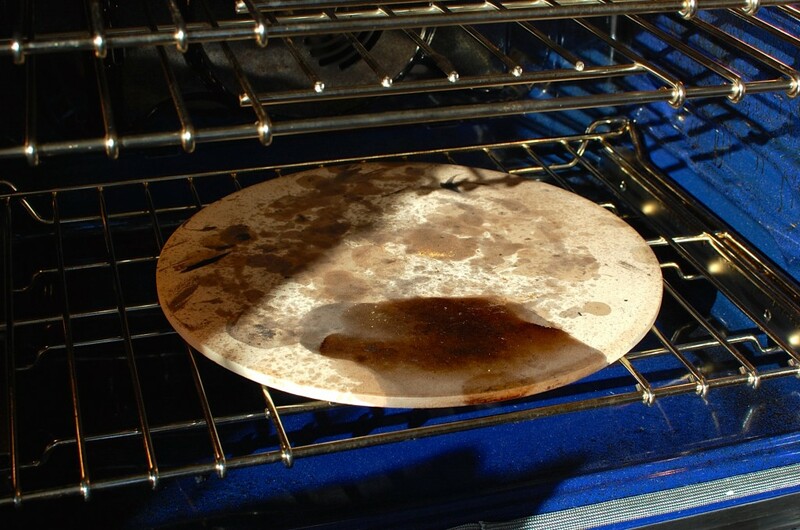 You may hear the crust crackle during the initial cooling step – this is called “sing” and is totally normal. If you can wait until the bread is cool, the texture will be much better. Voila! You have made bread!!!! 12. 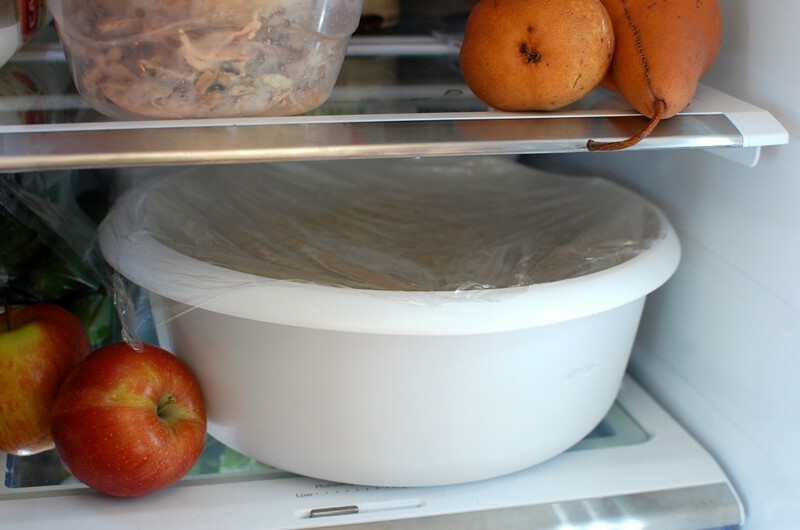 Store the remaining dough with a vented cover (you can use plastic wrap over a bowl with a few holes poked) in the refrigerator. 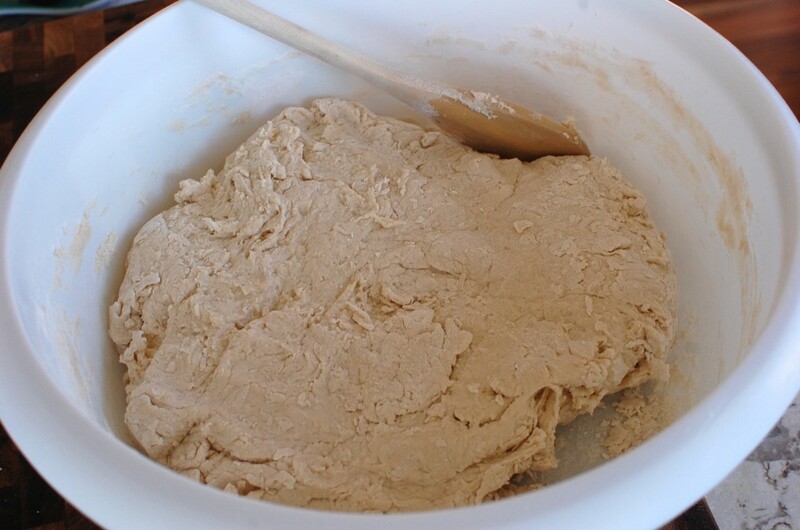 Use the remaining dough up within 2 weeks. I only have one caveat. If you slice your bread, be careful!!!!!!! 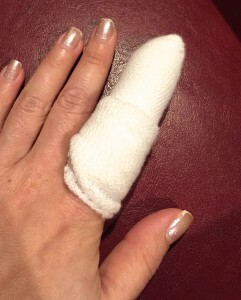 I was really tired, and using my nice sharp Wusthof Bread Knife… I sliced some bread… and MY FINGER…. really badly. I stood there in disbelief as the pain surged up my hand into my brain… and AHHHH! My husband had to drive me to the Emergency Room while I clutched my finger in a kitchen towel trying to get the bleeding to stop… I sat there for 3 hours with gauze and green tape wrapped around my finger until they had the time to glue the laceration back down with steri-strips. It didn’t hurt so bad once they injected my finger with some kind of numbing agent – but man did that injection burn and hurt like crazy! Thank goodness I didn’t need stitches! Moral of the story: Make sure your fingers are FAR AWAY from the loaf when slicing!!!!! 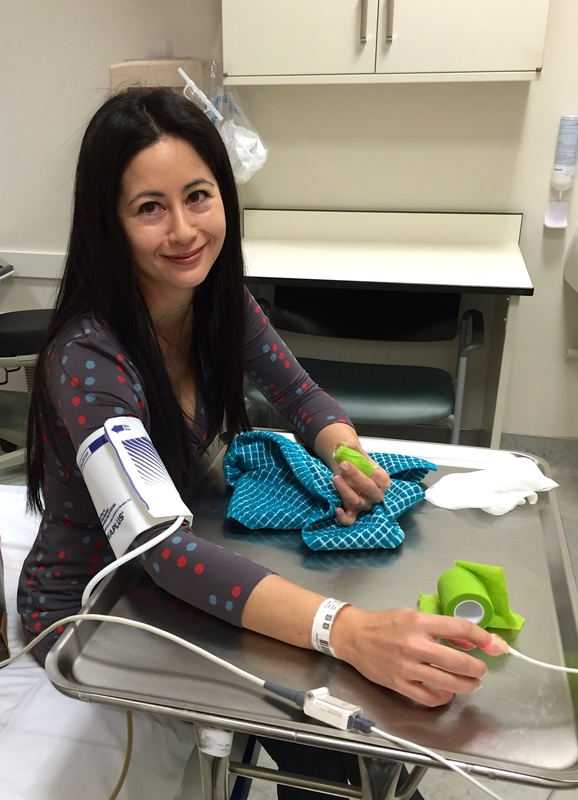 Don’t make bread just to end up in the ER! My husband was making fun of me in the Emergency Room for being so clumsy with my bread knife. This is why I haven’t posted anything for awhile… it’s hard to cook when you have the use of one hand only! Happy New Year. Sorry to heard about your cutting accident. Hope your finger is heal by now. Thanks for all your hard work that you have put into this blog and share with us your knowledge and skills. And more important, thank for always promptly reply our questions regardless of how idiotic or mundane they can be at time. Keep up the good work and I hope to see more of your recipes in 2015. I bet it is hard to cook with 1 hand but it probably just as hard typing this post with 1 less finger. Haha you’re right! It took me forever to type out that post… it’s funny how you don’t realize how much you use one finger on your non-dominant hand! Thank you for the good wishes… hope you have a wonderful New Year too! Love your site. Going to give this a try on the weekend. Got a few questions with the yeast, whats the difference between dry active yeast and just dry yeast. Is it the same thing? Also if i store my yeast in the fridge, do i need to get it to room temperature before using? How long will it last. I was hesitant picking up a container of yeast and opted for the mini pouches which costed like 10 times more thinking the container I will never be able to use that quickly. Hi there! Most cans of yeast will have an expiration date on it somewhere. 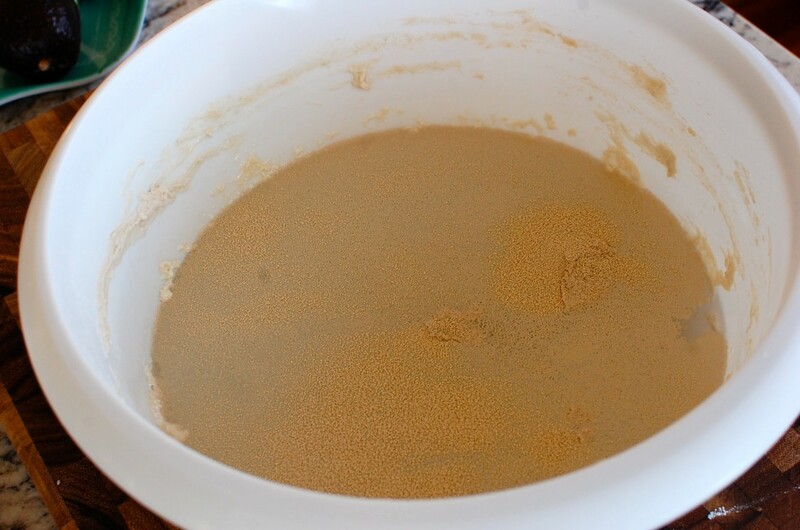 Store it in the refrigerator (tightly closed), and your yeast should be good until that date. For me, I just use it cold right out of the refrigerator because most recipes involving yeast will have some kind of “warm up” step (like using warm water, or warm rise location). As for how long will the can last… it’s kind of a calculation with how often you bake. If you bake a lot, then you might save more money buying a can/jar of yeast vs. the small envelopes. If you don’t bake that much, then go for the envelopes.